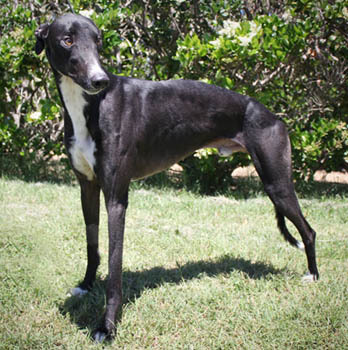 Keeper, aka Keeper Fantastic, is a gorgeous 2-year-old black male with white accents born November 5, 2009. Keeper's sire is TK Quick Strike and his dam is Cira's Lemon. 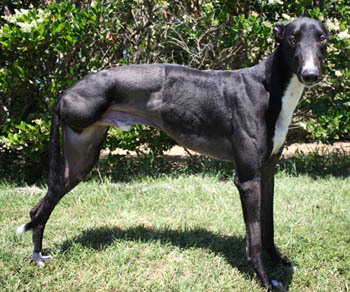 Keeper has 24 races to his credit on Greyhound-Data.com, all at Gulf Greyhound Park in Texas. He started his career on October 22, 2011 and it ended abruptly on March 15, 2012 with a broken leg. Keeper was evaluated by Dr. Christy Soileau at Preston Park Animal Hospital and was scheduled for surgery with Dr. Radasch of the Dallas Veterinary Surgical Center. After consultation, it was clear that the best outcome for Keeper would come from amputating the leg due to the severity of the break. Keeper is now fully healed from his amputation, and is ready to hop right into your life! Keeper's Cat Test: When this beautiful laid-back boy spotted the cat, he wasn't so laid-back anymore. There was some snapping action behind the muzzle. Now we know he is not destined to live with kitties! Keeper is very loving, affectionate, and just wants to be wherever his people are. He will kiss your whole face if you let him, loves to be petted and loved, and is a very happy boy. He does not seem to be afraid of anything - it's almost like he's been in a home all his life. 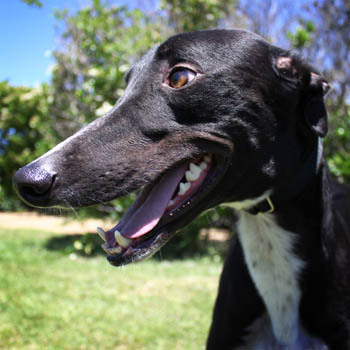 This handsome guy has so many adorable features that there are too many to list - from his Cookies & Cream chin, to his ears where one points forward while the other points back, he is one big bundle of cuteness and love! Keeper roaches on his back but is still working on his balance with only one back leg. His house manners are good, he loves his crate, walks well on the leash, and sleeps through the night.